because I would have taken this dog home with me. Well, I guess I actually AM a "pet person" because I do like animals , I just don't want one in my house spewing fur all over the place. Well anyway, this is my mom's dog Lucy. 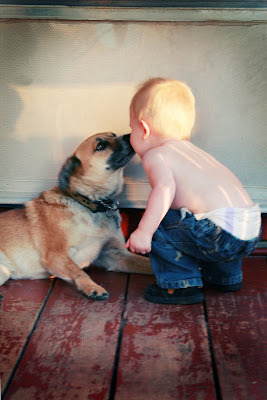 Zander and Lucy must have known each other in heaven because they had a special bond like Timmy and Lassie. Ok, not like them so much. There was no dog/boy verbal communication, or rescuing old man withers from the mine shaft or anything- but you get the idea. It was so cute watching them play together. Zander would love to have a dog but unfortunately I'm not that nice of a mom (although I hear pet rocks are all the rage right now). That is pretty cute. But I am with you on the no pet thing. Sadie had a dog with her three kids I say had a dog because they don't have him anymore. So I will learn my lesson from those that have gone before me. I'm shipping that dog to Zander, it's the right thing to do. ok so I can't believe how long it has been since I looked at your blog geez I am out of it, good luck with jumping off the empire state building and running the marathon :) I support you with the latter...anyways how are you? Being a pet person is not the same as being an animal person. I like animals, but don't want to hold their poop in my hand or have it licking my face. Ugh. OK, I would like to clear up a misconception here.... I don't keep the dogs in the house, we have a 6 acre farm. AND, I hope your happy, Lucy has been in a funk since the boy left. She has stopped hopping all together. As for Chevy, she is perched staring at her dog spit covered rope waiting for Z to come out the front door and throw it to her. Lucy and Chevy will be starting their therapy soon. Ohhhh that is too cute. I love how you took that pic too,, your good! Zander would have loved OREO... ya, stinky Oreo who is buried in our back yard off the cliff now at the Sandy house. Oh wait ,, maybe Carther and Brode dug her up the other day... well any way.. Zander would have liked her even though she had very bad halitosis. I know... When Greg dies, I will get a dog and keep it at my house for Zander to come and play with. Oh wow that didnt sound too good now did it,, ok well just take Zander to your moms house. Jess!!! That picture is the cutest picture ever- your new heading. SO cute.